Hello! It feels like a true Fall day here in Kansas (at least it does on the day I'm writing this). It is actually chilly. I'm not ready for snowflakes yet, but it does feel nice to have temps a little lower than they have been (remind me that I said that when I'm sitting out at my son's football game tonight freezing!). 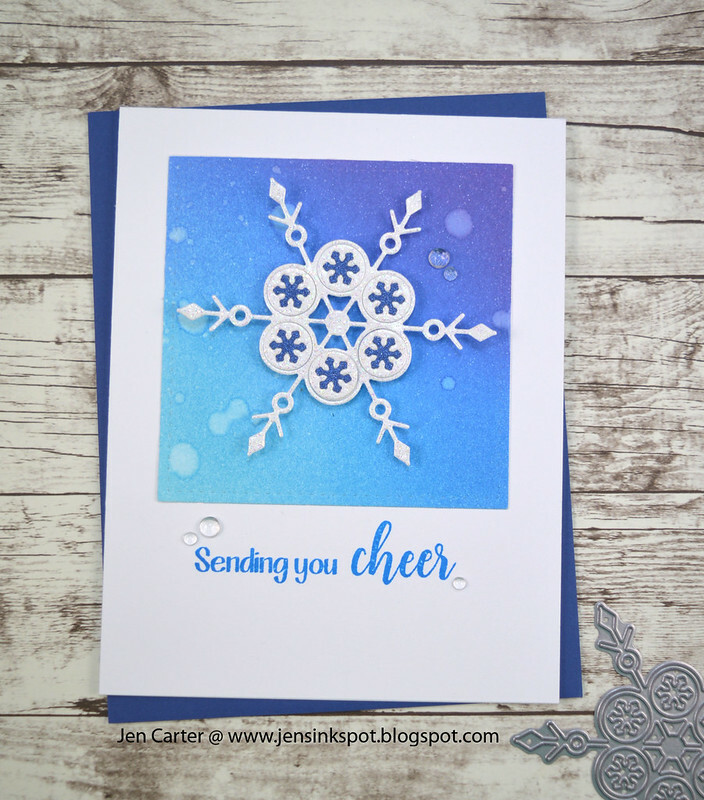 So, on that note I wanted to share a card that I made using products from the newest Frantic Stamper release. This Alpine Snowflake die is gorgeous! I die cut it out of white & blue glitter paper and popped it up on the background. To create the background I masked off the area that I didn't want to ink and then used It's a Boy, Fiesta Blue & Something Borrowed inks to create the "sky". Then I dropped some water on it to create the splotches. The sentiment is from the new clear Hot Cocoa Sentiments stamp set. Oh my goodness !! This is such a stunning card !! Winterhaven Stamp of Approval Release Day!